Hope everyone is having a good October so far and is getting well and truly into the Autumn spirit. Not going to lie, I am loving the fashion out there at the moment (checkered prints and mustard jumpers are a thumbs up from me). Seriously, I need to keep myself away from the high street because my bank balance cannot take it any more. There is only so many chunky knits a girl can own right? Na, not right, give me them all! 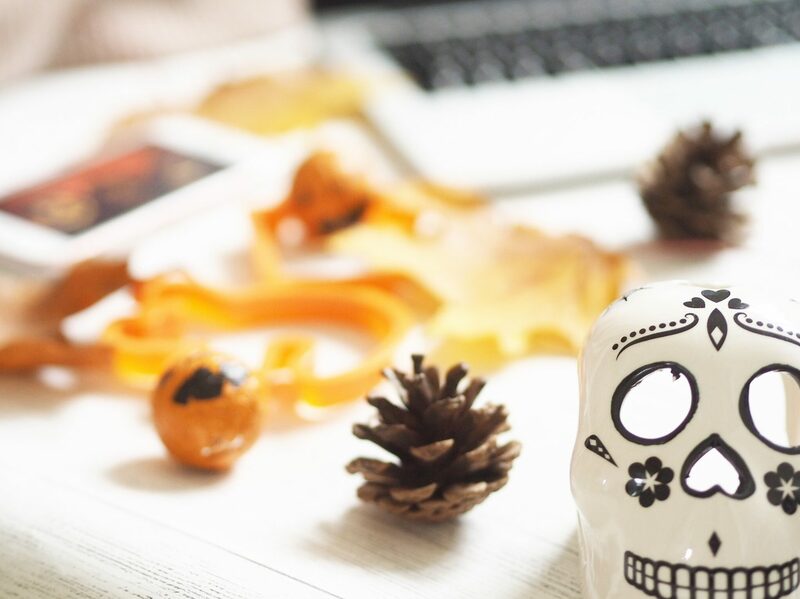 Anyway, as I am getting super excited for Halloween so I wanted to write a post on ways to really embrace this time of year and enjoy halloween to the max. I know not everyone really ‘celebrates’ Halloween, but you can still get involved in most of these things anyway, just for fun! I personally enjoy watching ‘scary’ horror films, sometimes when they are so far away from reality, I think they are hilarious to watch ( which really isn’t the point of a scary film), but I like to watch them anyway. However, to get me in the perfect mood, I like to dim the lights, put on the candles and sit in front of a super large TV. If only I had the Panasonic 4K TV range! This would be the ideal TV to watch horror movies on! This is a given at Halloween! I think as soon as it turns cold outside, I instantly reach for the cookbooks and flick through lots of recipes to see what I can bake in the oven next! Seeing as it’s Halloween, why not get creative and bake some simple, yet decorative biscuits! There are lots of different recipes to follow, but i like this one from BBC good food. You can pick up some novelty cutters from Supermarkets or online like eBay/ Amazon etc. I mean who doesn’t like a house party!? These bring me back to the days where I was 16 and experimenting with drinking 2 bottles of rose thinking it was a good thing to do, and waking up with NO HANGOVER! Nowadays, one glass and the rooms spinning, my head is aching and I wake up feeling terrible! Enjoy your teens is all I’ll say if you’re reading this and you’re under 20!. If you don’t fancy going wild, maybe a nice sophisticated dinner party is on the cards, but either way, decorating the house/ room and inviting friends and family over is a great idea to get in the spirit. You can literally pick up Halloween decorations so cheap nowadays so adding a bit of spookiness to your house/ room will deffo get you in the spirit. Okay, so you need to check this out for Halloween drinks! I can definitely spot a few on there that I would like. I love the names and the colours used to make these drinks extra spooky for this time of the year. So there we have some of my ideas to help you get into Halloween spirit and have fun around this time of the year. It doesn’t all have to be doom and gloom! Let me know in the comments below if you have any plans! Halloween is my favourite! We always carve a pumpkin each and put tea lights in them on the doorstep. Love baking Halloween biscuits too. Such a great post. Love the pics! I absolutely LOVE Halloween! I’d rather have Halloween than my birthday so this is a great list for me (except the horror films. I’m a scaredy cat!!). I also lovvvvvve The Purge! It’s definitely in my top 5 Halloween films. I’m loving the fashion too! The purge films are actually really good! You should watch the tv series scream on Netflix at this time of year, its sooooo good.